The newest Rail Road Car at the Gunnison Pioneer Museum is pictured above. This picture was taken in the mid 1990’s. If you want to see what it looks like after being moved to the Pioneer Museum in 2013, you will have to visit the museum. D&RG Sleeper car #04533. This car was used by the railroad as a sleeper car for workers while working on the railroad tracks. After the railroad was taken out of Gunnison it was moved to the airport to be used as a storage unit. US Forest Service acquired the car from Gunnison County and trucks were obtained from Durango and Silverton Rail Road by Tim Ross (from Hermosa) to move the railroad car to Gunnison Pioneer Museum. The rails the Sleeper is placed on were acquired from Rocky Mountain Arsenal which were removed by National Guard. Railroad Depot was donated by the Irby family of Sargents, Colorado. The depot was located on the Irby Ranch. The Water Tower was moved to the museum from Mears Junction, Colorado. It was located on the east side of Marshall Pass and was filled with 50,000 gallons of water. The water was hand pumped from a well or hauled from a nearby creek or spring. The tower was moved in 1971 and erected on the museum site by the Bill Ender Family. Cinderella Engine #268 built by Baldwin Locomotive Works and was used for 73 years in Gunnison. This engine has been on display at the Chicago Railroad Fair. “Rush to the Rockies Centennial” and in the movie “The Denver and Rio Grande” in 1951. The Flanger OD which was mounted behind the engine and used to remove snow and ice from between the rails and to push it off of the track. The snowplow mounted to the front of the engine helped to break the track open. Next, the Gondola car was used to haul coal. Thousands of tons of coal were shipped from the mines in the Gunnison Valley. As many as 25 coal cars were shipped daily to the Colorado Fuel and Iron Company in Pueblo, Colorado. 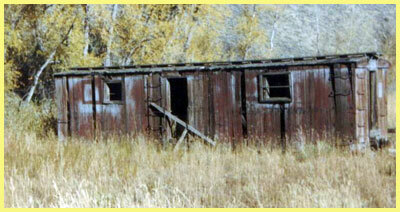 The Freight Car or Box Car is our next car, it was used to transport hay, grain, and a wide variety of freight. Most items sold in grocery stores were brought in by train. The stock car was used to transport cattle, horses, and sheep out of Gunnison for the ranchers. This was the most popular way of shipping livestock to the market to be sold. There is a weed burner was used by a different train crew to burn weeds and to clear brush from along the tracks to help prevent grass fires. The Caboose is our last Railroad car on display. The conductor, maître d’ and PR man of the train rode here when the train was traveling. The brakeman and switchman also rode in the Caboose. The brakeman rode in the Cupola where he had a 360 degree view of the track. Bring the family to the museum and let the kids ring the bell on Cinderella Engine #268. The kids will like it and our workers also enjoy hearing the bell. This concludes my article this week, remember the museum is always accepting new members and volunteers. 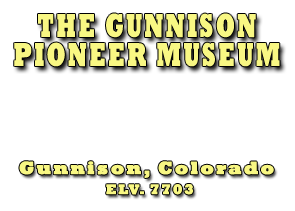 Just ask at the desk for an application to join the Gunnison Pioneer Museum.